A new “non partisan” initiative claiming to help UK students pick the area in which they are most likely to have an impact in the General Election is in fact run by Labour Party supporting groups, Breitbart London can reveal. The GE2017.com website, which allows students to punch in their home address as well as their student accommodation address, then recommends where their vote would be more impactful, claims to be “non partisan”. 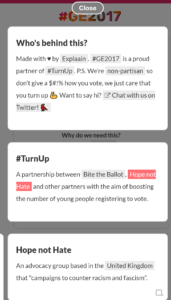 But further investigation into the #TurnUp hashtag being used by the group reveals the organisation to be a project of two organisations: Bite the Ballot and Hope Not Hate. 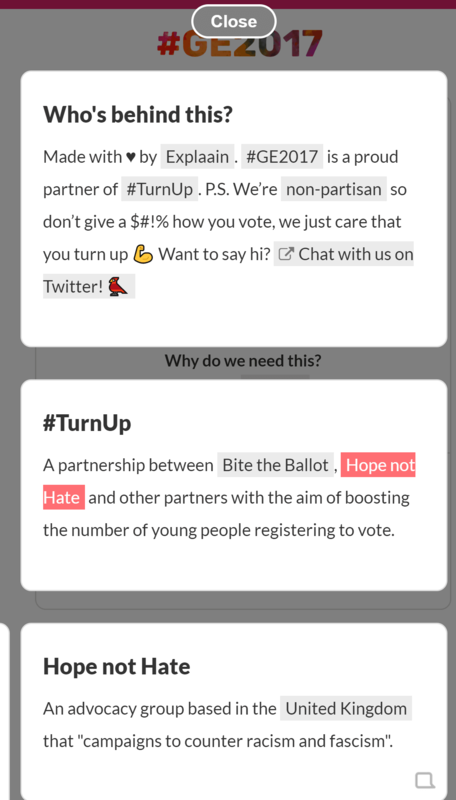 While Bite the Ballot has claims to a cross-partisan approach to youth voter engagement, Hope Not Hate’s approach to UK politics can be described as nothing short of divisive and hysterical. The group, led by Chief Executive Nick Lowles, has focused on minimizing the successes of the UK Independence Party (UKIP) in recent years, going so far as to plough massive resources into campaigning against former UKIP leader Nigel Farage in 2015, as well as spending its cheques from the George Soros Open Society Foundations and others, on keeping a running blog on UKIP activities and candidates all across the United Kingdom. Hope Not Hate, which was launched in 2004 by then editor of the hard-left Searchlight Magazine, was lauded by key Labour Party figures such as former Prime Minister Gordon Brown, and recent celebrity hanger-on Eddie Izzard. The group recently fundraised off the back of a claim to be suing Mr. Farage for asserting the group’s activists were “extreme” and used “violent and undemocratic means”. 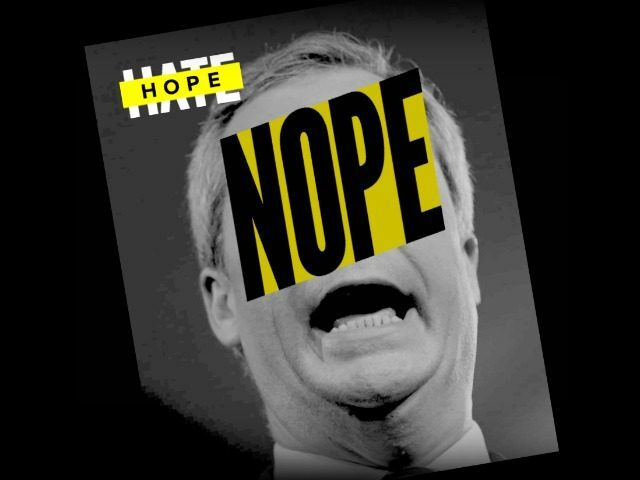 The charge, denied by Hope Not Hate, has been echoed across the country by UKIP supporters and activists who have had run-ins with Hope Not Hate’s campaigners, including your correspondent. The group’s website states: “Help build a targeted opposition to UKIP, Nigel Farage, Arron Banks, and any other candidates of hate” as well as maintaining a section where people can see who their local “far right” candidate is in the General Election. The candidates named are almost all UKIP candidates, and including people like David Kurten, a black science teacher standing in Castle Point in Essex, Sarul Islam Mohammed, a Muslim anti-radicalisation campaign who has been threatened by hardline Muslims, Star Anderton, a disabilities campaigner, Nigel Sussman, a Jewish man standing in North London, Rathy Alagaratnam, a Sri Lankan-born UKIP campaigner, and Ujjawal Bhardwaj, a former Labour Party member standing in Luton South. The group’s ire has not been solely reserved for UKIPers, either. In 2015, the group released a paper implying that practising, reformist Muslims such as Dr. Zuhdi Jasser and the hijab-wearing Raquel Saraswati were somehow “Islamophobic” because they challenged the primacy of Shariah Law. The charge led Dr. Jasser, a doctor based out of Arizona in the United States, to blast the group as “Orwellian bigots”. The group was recently found by the Economist magazine to have overstated hate-speech online by a factor of 3000 per cent. While the GE2017.com website does not make it clear through any branding on its homepage that it is a project of Hope Not Hate, several clicks through on the website reveals the information, describing the group as “an advocacy group based in the United Kingdom that ‘campaigns to counter racism and fascism'”. Hope Not Hate was one of the beneficiaries of a recent fundraising drive in memory of the murdered Member of Parliament Jo Cox — whose widower Brendan, a supporter of Hope Not Hate, worked for former Labour PM Gordon Brown. The group was named alongside the Royal Voluntary Service and the White Helmets organisation in Syria as primary recipients of the fundraiser.